Enjoy a FREE Big Mac with every valid entry and get a chance to win prizes worth RM20,000! 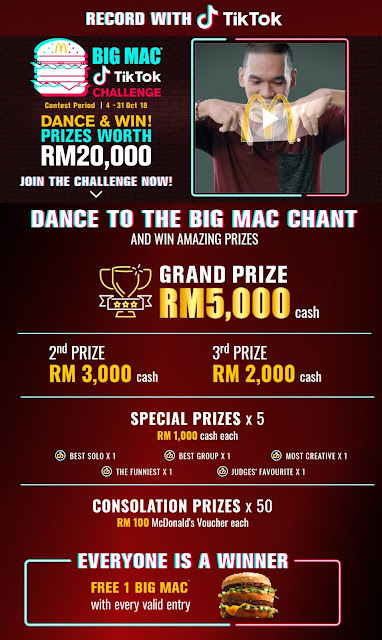 TikTok, the world’s fastest growing short-video platform, has partnered with McDonald's Malaysia to launch the #BigMacTikTok challenge, inviting Malaysian creators to showcase their best moves! From 4 – 31 October 2018, TikTok users can join this challenge and unleash their creativity by creating their own TikTok videos using any of the Big Mac chant songs, powered by McDonald's. Each valid entry can win a FREE McDonald’s Big Mac and also be in the running to win prizes worth RM20,000. Top three (3) participants with the most creative entry will win cash prizes worth a total of RM10,000, while five (5) participants with the best entry under selected categories will win special prizes of RM1,000 each. Fifty (50) McD vouchers worth RM100 will also be given out as consolation prizes. To find out more about the #BigMacTikTok challenge, visit https://www.mcdonalds.com.my/bigmactiktok.